An interesting climbing plant or shrub, Marianthus bicolor is a plant that thrives in warm conditions. It will grow well in rocky, sandy or poor gravelly soils and flowers in the heat of summer into autumn. It is naturally a twining scrambling plant and can reach a height 3 metres if it has support. With no support it forma a scrambling shrub. Grow it on a sunny fence or wall, or a trellis. Given a warm sunny position and good drainage this is very adaptable plant. It will easily tolerate drought and most frosts. It can be pruned lightly to maintain size and shape and it will attract bees and insects to the garden. Soil – Well drained loam to sandy loam. Well drained clay or gravel. Position – Sun to a little shade in the afternoon. Climate – Warm to Hot. Saline soils – Mild salt soils. 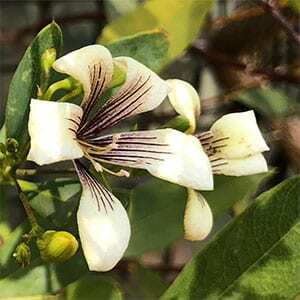 Flower colour – Creamy white with violet stripes. Fauna attracting – Birds, bees and insects.